Another day with lots of economic data releases. On the housing front, mortgage applications decreased 2.6% for the week ending July 27. Refinancing was down 2% and Purchases declined 3%. 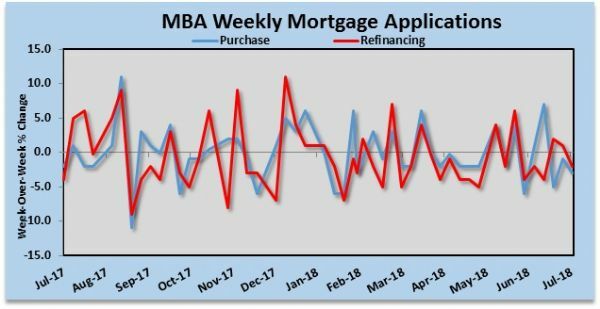 Thirty one percent of all applications were for refinancing, a decrease from 36.8% in the prior week. Adjustable rate mortgages (ARM) increased to 6.4% of total applications as loan amounts increased. June total private construction spending decreased 0.4%. Year over year, total construction spending is up 6.1%. However, there were upward revisions to May spending, which helped offset the lower June numbers. Residential spending was down .5% and nonresidential dipped 0.3%. Single family home construction was down 0.4% and multifamily construction dropped 2.8%. Year over year, private construction spending is up 6.5%. Total public construction dropped 3.5%, which was due to a decline in non-residential spending, primarily a decrease of 1.3% in highway and street spending and a decline in educational spending of 11%. Year over year, public construction spending is up 4.9%. The ISM Manufacturing Index dropped to 58.1% in from 60.2% in June. A reading above 50 indicates expansion. Seventeen of 18 industries saw expansion, only primary metals contracted. The weekly report from the Energy Information Administration (EIA) confirmed a build of 3.8 million barrels of oil were added last week for a total of 408.7 million barrels. At this level, crude oil inventories are below the 5-year seasonal average. Gasoline declined 2.5 million barrels, while distillates increased 3 million barrels. WTI is currently down 1.40% to $67.80 as stockpiles coupled with trade concerns pressures the commodity. Apple’s (AAPL) blowout earnings was not enough to keep the major indices in the green. Nasdaq is the lone bright spot, up .23%, while the Dow is down .25% to 25,352 and the S&P is down .15% to 2812. The Federal Reserve rate decision is due out at 2 pm ET. Expectations are that rates will remain unchanged.